Matt is a Lecturer in Human Geography and currently holds a three year Early Career Fellowship funded by the Leverhulme Trust. He is a member of the Geographies of Social Change and Power, Space and Politics research clusters. Before arriving at Newcastle, he was an Early Career Fellow at Keele University in the Research Institute for Social Sciences. He has extensive experience of teaching human geography at undergraduate and postgraduate levels having been a University Teacher at the University of Liverpool, a Teaching Fellow in Human Geography at the University of Reading and Royal Holloway, University of London (where he completed a PGCert in Teaching Skills for Higher Education). He has a PhD, MA in Cultural Geography and BA (Hons) from Royal Holloway, London. His research focuses on how geopolitics is represented, lived and experienced in people's everyday lives. More specifically, it looks at how young citizens imagine and engage with geopolitical issues across a host of different geographies encompassing institutional, domestic and public spaces. 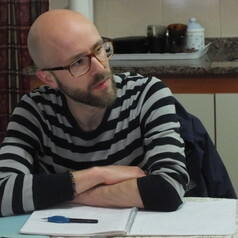 The regional focus of his work centres on geopolitics in Latin America with an emphasis on the Southern Cone (predominantly Argentina and Chile) and Antarctica, although he has experience of undertaking research with children and young people in different parts of the world including the UK, South Africa, Argentina and the Falkland Islands.